Quilting Adventures: Life, the universe and Diet Monday...! Well it's that time of the week again and as you know, I do not own a scale. Therefore, there's really no way for me to report the weight I have lost, if any that is! Over the weekend Penelope and I had a major play date. I've been busy machine quilting for a couple of good causes. I barely finished machine quilting Butterfly Kisses a BOM designed by Nancy Murty of Bee Creative Design . The colours are delicious! This quilt was made by a group of wonderful ladies and is being donated to help raise funds for the Glenwood Cemetery, a local non denominational cemetery in our village. This one was made by my friend Holly. Keep well everyone and thanks for stopping by! 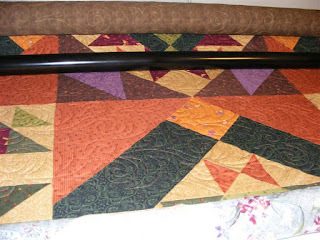 Must be hard sometimes to let a quilt go after you done the quilting. Both good causes for these quilts though. The kitty in your previous post always makes me smile! The very best way to keep track of weight loss in my opinion is how our clothes are fitting. Gratz! and keep up the good work. Those beautiful quilts will surely raise plenty for their worthy causes! You and Penelope have really bonded! Looks like you are really having fun with Penelope these days. Yay!!!! Loose jeans! You go girl!!! I am proud of you and yet jealous at the same time. I just can't seem to stay with it for more than a couple of days at a time. Love the quilts! Did you use pantos? If so, which ones? You know I always have to ask that. :~) You pick such pretty ones. Your quilting is spectacular! Well done on stretching the jeans,sorry Ii mean the weight loss. Its very defineatly weight loss when the jeans are loose!! I love the combination of those beautiful greens! Hey you!! 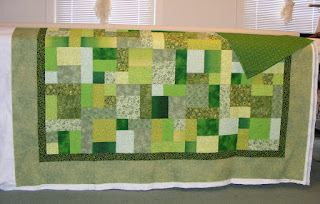 Love the quilts and guess what?? I do the same thing with my jeans. Hubby told me to wash them then put them on WET. LOLOL!!!!!!!!!!! Should I smack him?? Glad to see some quilting!! those quilts are beautiful. great that your jeans are loose!